Q. Hello. Am I really talking to Father Christmas? Q. Wow! Can you do something Father Christmassy. Q. How about that ‘ho ho ho’ catchphrase of yours? Everyone loves that. I’m a bit busy at the moment. And, it’s not Christmas yet. Next you’ll be asking me to honk Rudolph’s nose. Q. But, is his nose really red? Of course it is. You would have a red nose if you pulled a sleigh from roof to roof on one of the coldest nights of the year. Now, can we get on with the interview? Q. Of course. Firstly, can you tell me how you got the names Father Christmas and Santa Claus? Good question. When I was known as just Nicholas I gained a reputation for giving children lots of presents. I was, if you don’t mind me saying, generous to a fault. So much so that I became a saint – Saint Nicholas. In Dutch that is pronounced ‘Sinterklass’ which the Americans turned into Santa Claus. But, in England I’m Father Christmas, because I am the Father of Christmas. In Spain I’m Papa Noel, which means exactly the same thing. Q. 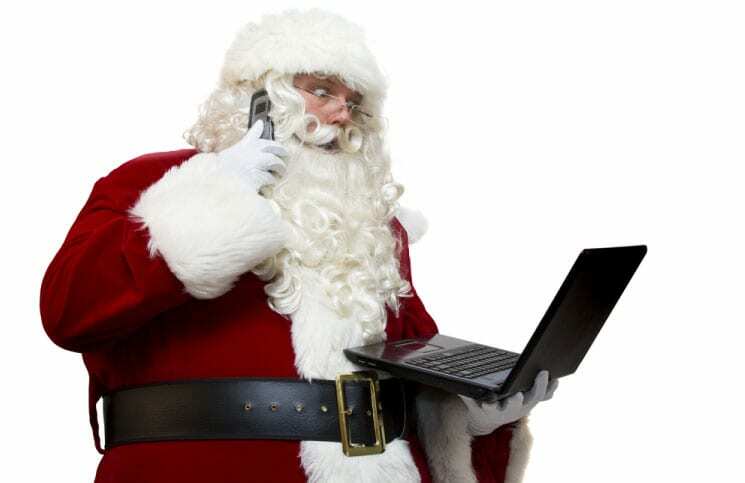 How did you get the Father Christmas job? I got a letter through the post asking if I’d like a very special career where I would live forever own a big pad in Lapland with a team of elves and an amazing red sleigh pulled by flying reindeer. I thought it was spam mail, a hoax. Anyway, I jokingly replied ‘yes’ thinking nothing would ever happen. Two weeks later I opened my front door and found a sleigh, a team of reindeer and a gang of bored elves on my doorstep. I couldn’t believe it. I climbed into the sleigh’s driving seat where an envelope had my name on it. Inside was a list of instructions for my new job as Father Christmas. Q. What did the instructions say? They listed the perks: free uniform, a regular upgrade of the company sleigh, six months holiday and an annual supply of mince pies and brandy. But, buried in the small print were details of the most demanding job in the world – allocating presents to well behaved children and delivering them secretly on just one night of the year. The next thing I knew I was on my way to Lapland. Q. Delivering all those presents must be difficult. Who or what helps you? I employ hundreds of elves who make and buy the presents, as well as care for my magic reindeer that fly the sleigh. The sleigh now has a sat nav which is a big help. Although it can still get addresses wrong. A lot of parents text me their postcodes or include it in the letters their children send to me. Q. How do you manage to sneak into people’s houses to deliver presents without waking up the children? Ah, that’s the tricky bit. Children can get so excited and often have trouble sleeping on Christmas Eve. Over the years this has become increasingly difficult. But I rarely get caught out. Many houses in Hammersmith are Victorian terraces so still have chimneys. I have to diet for most of the year so I can fit down them. Sometimes a little magic dust is needed to help me fit. A lot of houses have burglar alarms which also can cause problems. Again, I often text parents to let them know what time I’m due to land on their roofs so they can disable the alarm to let me in. But obviously parents are under strict instructions not to share my telephone number with children. That’s the deal. Q. What time are you due to arrive in Hammersmith on Christmas Day? At the moment my STA (that’s Santa’s Time of Arrival) is about 12.42am. I just hope all the children are asleep by then. Now, you will have to excuse me. I have a consignment of bikes and games consoles arriving from China in a minute. So, I’m going to have to say goodbye. Q. Thank you very much for you taking time to talk to me. Q. One last thing – please do your famous catchphrase? Everyone would love to hear it. Just once? Oh okay. Just once. HO, HO, HO TO HAMMERSMITH!! Meet Father Christmas on Saturday, December 12, from 2pm to 4pm at the Thatched House, then The Andover Arms from 6:15pm. If you would like your child to see Father Christmas on the day we highly recommend you buy a ticket as soon as possible. Tickets for the Thatched House are available at the bar at the Thatched House.